The main isotopes of uranium contained in this table have extremely long lifetimes with the exception of uranium 232. All are alpha emitters of 4 to 5 MeV of energy. The left columns of the table show however the presence of a low energy gamma radiation and rare decays beta. Specific activities (activities reduced to 1 gram) are inversely proportional to half-lives. Uranium 238, which alone constitutes 99.3% of natural uranium has the longest lifetime: its period is 4.5 billion years, about the age of Earth. It is not very radioactive. Its very long period says it is still present in the Earth crust. Neutron capture by this nucleus leads to the formation of fissile plutonium-239 in a reactor. Hardly fissile, U-238 contributes to the operation of reactors and production of electricity through this plutonium. This impressive potential of fission energy remains still largely unexploited. The purpose of the fourth-generation breeder reactors is to recover this fantastic potential. Uranium 235, the only existing fissile nucleus found in natural uranium, is used as a nuclear fuel in reactors and as an explosive for nuclear weapons. This very rare isotope, present at the concentration of 0.7% in natural uranium, is thus a highly strategic and coveted material. Its very long period, 700 million years, is however, 6.5 times shorter than the isotope 238. At the time of the formation of Earth, U-235 was 85 times more abundant. The 0.7% observed today are a pale residue of this past abundance. If humans had been present at the beginning of Earth, they would not have needed to enrich uranium to make atomic bombs or operate their reactors! Uranium 234 is the first long-lived descendant of uranium-238. In a natural sample of uranium, these nuclei are present in the unalterable proportions of the radioactive equilibrium of the uranium-238 filiation at a ratio of one atom of uranium-234 for 18 800 atoms of uranium- 238, so that the two isotopes contribute equally to the radiations emitted by uranium. The isotopes 236, 233 and 232 of uranium are formed in reactors from captures of neutrons not followed by fission. 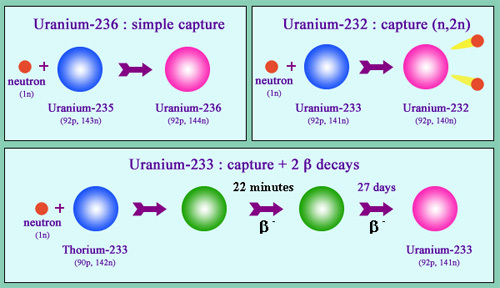 Uranium-236 is formed by a simple radiative capture by a nucleus of uranium-235 in contrast with captures that cause fission. Uranium-233 is formed by a similar capture by a nucleus of natural thorium, followed by two radioactive transformations. Uranium 233 is fissile itself. Submitted to the flow of neutrons from a reactor, it undergoes fission, but more rarely turns into uranium 232 by a reaction of specific capture (n, 2n) that triggers the expulsion of two neutrons. Uranium 236 is formed in the nuclear fuel from uranium 235, after neutrons captures that did not cause fission. The presence of this isotope in a sample of uranium means that the sample has beeninto a reactor. Uranium 233 is a fissile nucleus that does not exist naturally, such as plutonium 239, which it is close to by its mode of production. It is produced by neutron capture in reactors containing thorium. Fissionable by fast neutrons and slow neutrons, this nucleus has some interesting features for energy production. Reactors using thorium and uranium-233 are one of the options considered for the future fourth-generation reactors. Uranium 232 is a by-product of the reactors running with thorium and uranium 233 foels. The formation of this isotope results from specific neutron capture by uranium 233 that cause the ejection of two neutrons. Uranium 232 has a relatively short period of 68.9 years, but especially its radioactive filiation generates a descendant, thallium 208, that emits gamma rays of 2.6 MeV which are very energetic and highly penetrating. These intense radiations make handling of fissile uranium-233 contaminated with uranium 232, far more dangerous than conventional uranium 235 or plutonium 239 fuels. They constitutes an obstacle for the proliferation of bombs made of this fissile uranium. Access to page in french.